Was I in a coma or something? I realise that it has been ages since my last post. Sorry for having let you down. 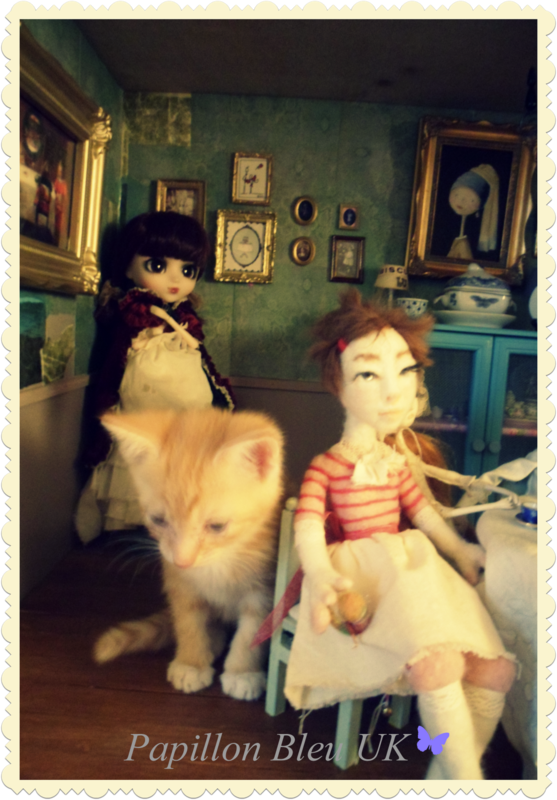 Anyway..the new doll's room hasn't evolved much from the last time but I think it is going to go to a little girls' home pretty soon as she really wants it. So, the projects are a bit changed at the moment. There is a doll in the making ( she is already reserved), I am super slow at this too but am planning to make more pink ones shortly. There is still one available at Benjamin Pollock's Toyshop if you really cannot wait ( I would contact them first to make sure the doll is still available). But...the most important of all....is....I am super madly in love! His name is Harry and has been in my life for over a month now. I love him! I love him! I LOVE him!!! But, in order to understand, I have taken some photos of us together. 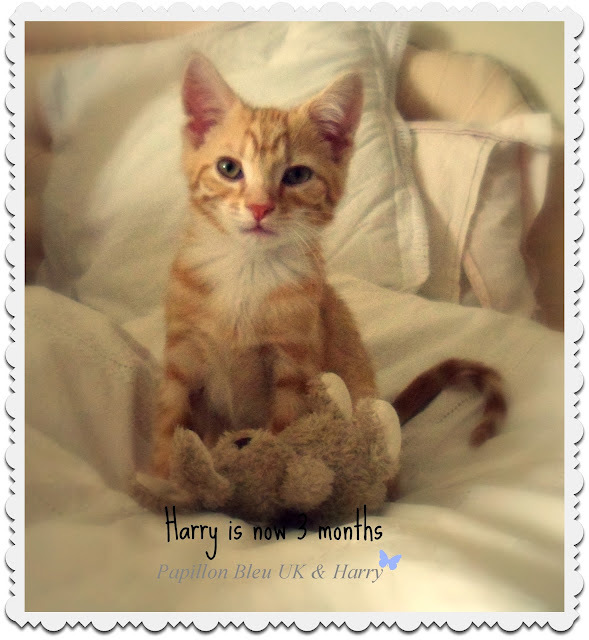 Yep...This is my little Harry when he was only 8 weeks old. And this is us bonding. He is like a little shadow, following us everywhere . We cuddle and play all the time! Of course, he also has access to my imaginary world and seems to enjoy it very much. 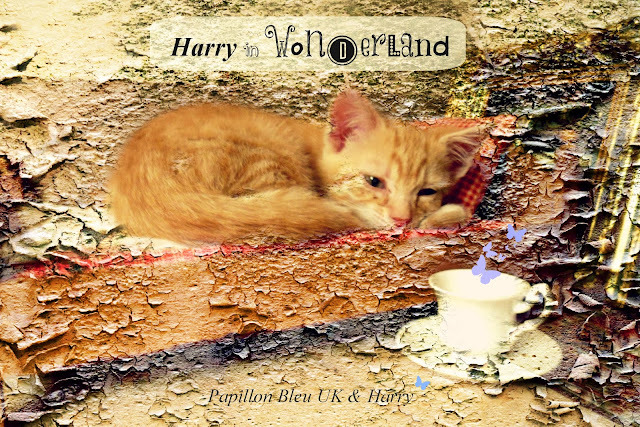 One day, Harry chose to explore the dolls' house ( I knew this was going to happen!) . He made the acquaintance of the owners of the house. But he soon felt tired and it didn't take long before he found out the little bed was a perfect size for his nap. ok...you see what I mean? Now he is 13 weeks old and is starting to look like a "big" cat. I mean...he has lost his baby look. And this is him now...see the difference? So...big sigh...I am madly in love with this fluff ball. He makes us laugh and we've gone completely gaga in the house. his stripes, his little pink nose, and...oh! ...his paws!!! So...this is it...I am completely and utterly in love. Yes...it feels sooooooooo good to be a mum again. Bye for now my blog friends, I hope you too have someone to love and cuddle. 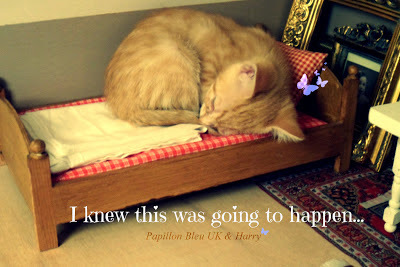 that was totally cute, Harry in your imaginary world, sleeping on that tiny bed... adorable. He's beautiful! Such a handsome cat! Also, he looks happy and content. Enjoy your little fluff ball! I completely get this new love affair. Harry is adorable! I can sooooo understand the intoxication of furry love! 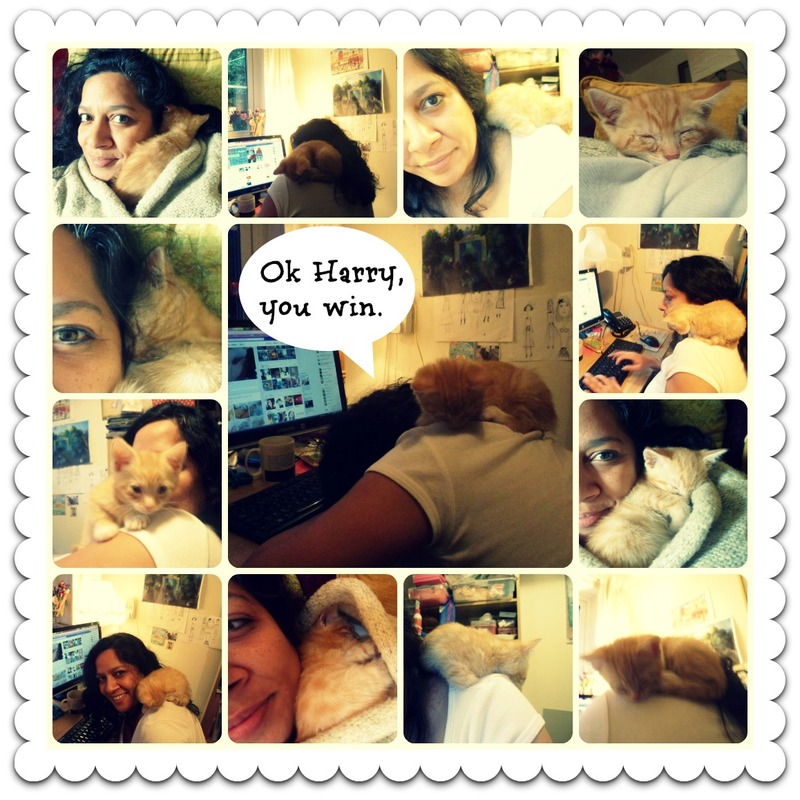 Your Harry is a total love kitty. The photo of him in the wee bed is beyond wonderful! What a gorgeous kitten. 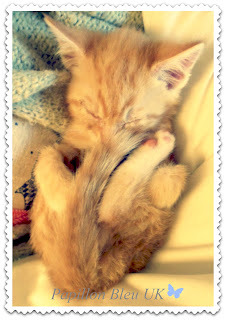 when she was a teenager my sister had a similar (female) kitten whom she called Pumpkin. Gros bisous et fais un câlin pour moi à Harry. Enjoy eachother, although ive no doubt after this adorable post. Good to see you back . A woman in love is a sight to behold :):). He is such a handsome fellow! He looks just like my Howie, who also loves sleeping in dolly beds. 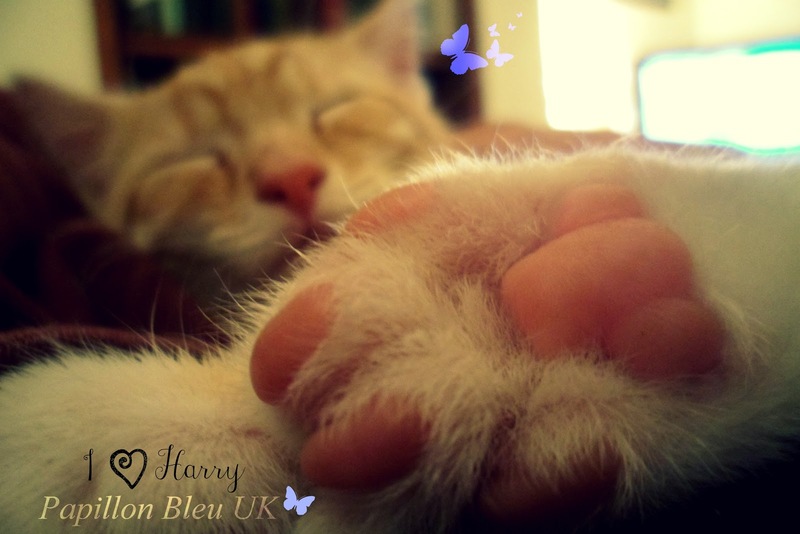 I adore sweet Harry! I have a soft spot in my heart for the ginger colored kitties...I always had one when I was growing up. They say the ginger colored ones have the most mellow personalities and I tend to agree. My sister Rebecca Howell-Gibson (in the Cloth and Clay doll ning site) had three, but now she has two. Whenever I go visit her they purr their heads off! The one she had to leave behind when the family moved from Massachusetts to Minnesota was the one who was the most shy, but he sat on my lap during an entire movie we watched one evening in their living room, he also purred constantly. 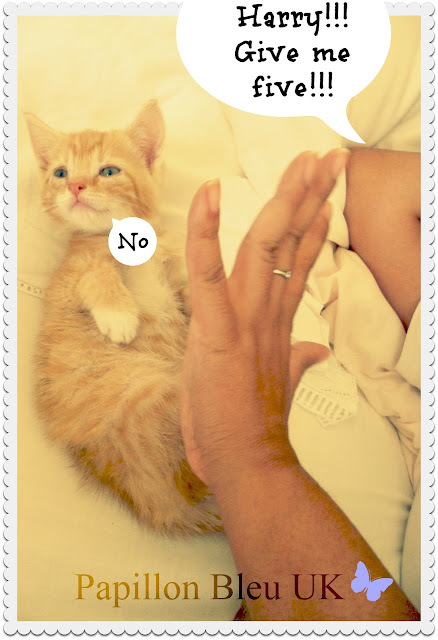 I guess cats have that six sense and can tell who will be their friend. These are the best images ever in the whole world ever ever ever!! !